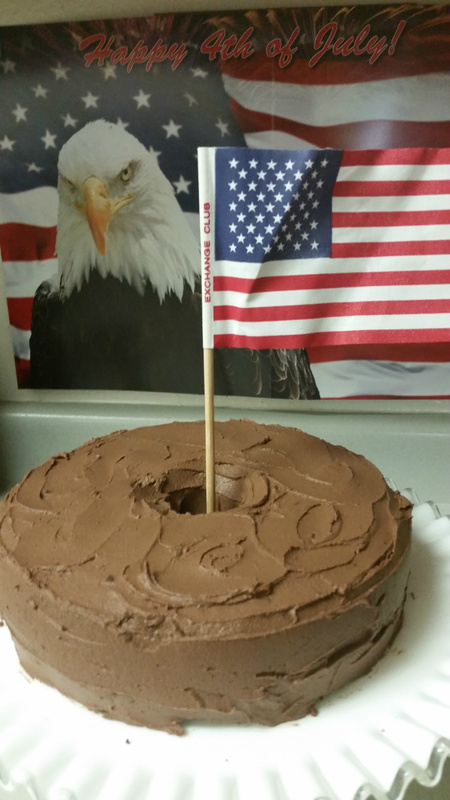 If it's the 4th of July there must be chocolate cake! The eagle has landed and he likes chocolate cake! I have had a lifelong love affair with chocolate. And cake. This, of course, is my mother's fault. She was a really fun baker. She also had a "secret" drawer in the kitchen that usually had a box of See's chocolates in it. I once bought her a pillow for Mother's Day that had "What do you mean chocolate is not a vegetable?" embroidered on it. You get the picture. But why do I equate the 4th of July with chocolate cake? I've made cakes for celebrations year-round. Hershey's homemade recipe chocolate layered cake, chocolate cake with liquor and ganache between the layers, "Death by Chocolate" which was more of a mousse and ladyfingers creation that incorporated a couple of dozen eggs and several pints of whipped cream, and Buche de Noel jelly roll cake with homemade chocolate frosting for Christmas Eve. 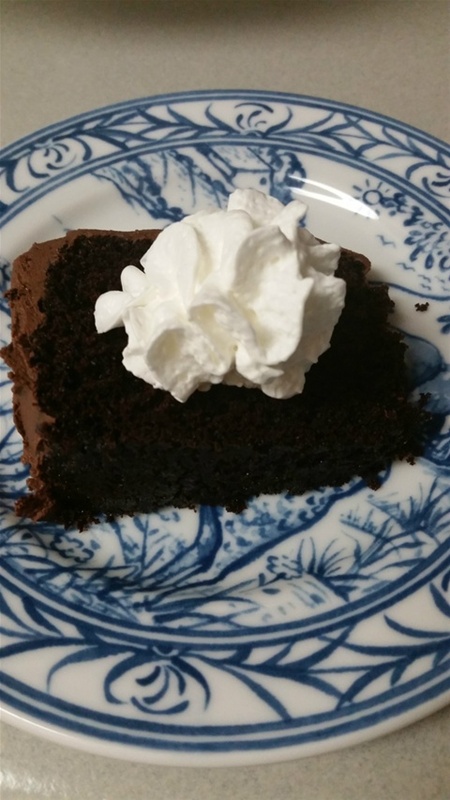 My oldest son's favorite cake is a "Texas" chocolate sheet cake from a family friend's recipe. He asks me to make it for him on his birthday. Growing up, my family used to attend a 4th of July potluck at my great uncle's house and family orchard in Creswell, Oregon. Picture a 1930's farmhouse surrounded by peach trees with a large grassy lot across the drive. Tables and chairs were set-up on the grass and most were shaded by large oak trees. It was always hot and muggy. The farmhouse smelled old and was dark. There were lots of people there who we only saw a few times a year. Somewhere in this scenario I remember cake. I'm talking old-fashioned, three layered, baked from scratch grandma cake. Somebody made one every year. It might have been coconut, or lemon, or chocolate, but trust me, there was a cake and it was the best part of the day. So, when I think 4th of July, I think cake! These days, I'm not so much into spending lots of time in a hot kitchen. But melding my love of cake and chocolate together, I've included two amazing recipes that are easy and don't require much time in the kitchen. One utilizes a microwave so unless the party is at your house, you might save it for another time. It's not too late to make either recipe for the 4th, but let's be honest, chocolate cake is great on any day! This is a Pinterest recipe that really works. 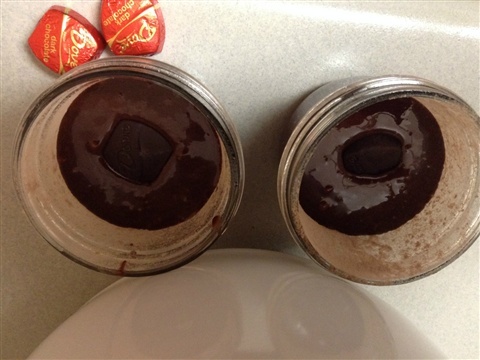 Basically, you modify a brownie mix, use individual parfait or jelly jars to make the cakes, and cook them in minutes in the microwave. Genius!! Mix brownie mix according to directions, adding oil and eggs. Spray jars or cups with cooking spray and dust with a bit of the brownie mix. Spoon batter into each jar - about 1/3 cup for each one to make 6. Press two Dove chocolates into the center of each cup and use a knife to spread batter over the top of the candy. * Place a cup on a small plate and microwave at full power for 1 minute. Remove the cooked cake from the microwave. If you wish, run a knife around the edge and turn out on a plate. 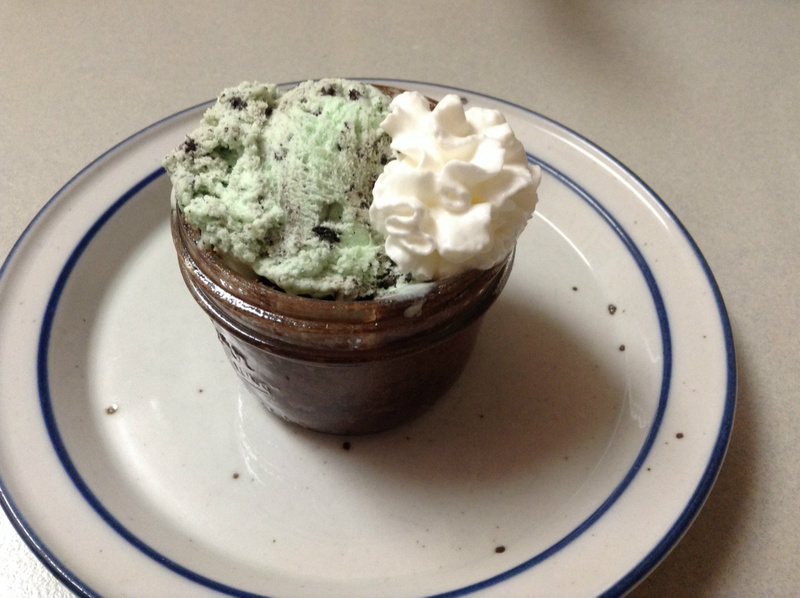 I simply served mine in the jelly jars and topped them with ice cream and whipped cream. They are warm, moist, and delicious! *The recipe says that you can cook up to 4 cakes at a time, adding 30 seconds to the cooking time for each additional cake. I only tried on at a time, and since I served them in the jars it really didn't matter if it took 6 minutes to cook them all seperately. Don't be tempted to fill them up to the top! One minute in the microwave. Easy to serve in the jar. 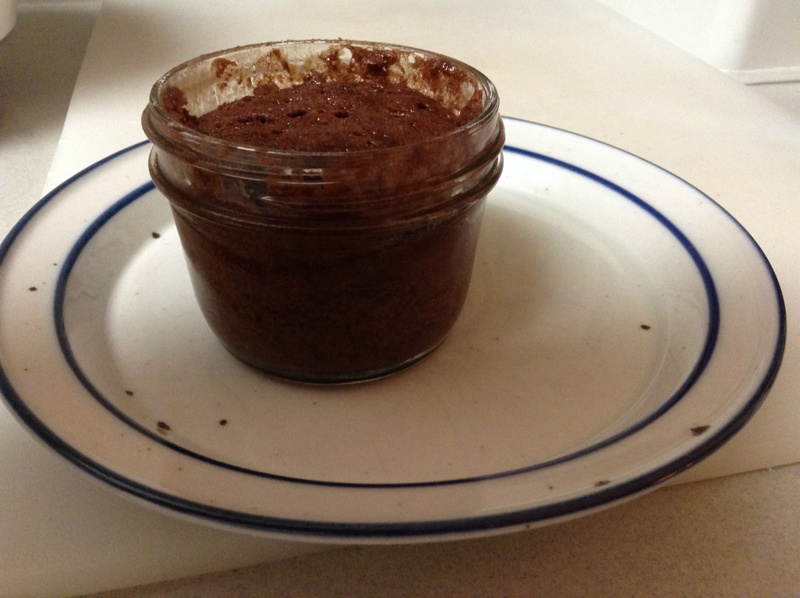 The Best Chocolate "Dump" Cake so Far! 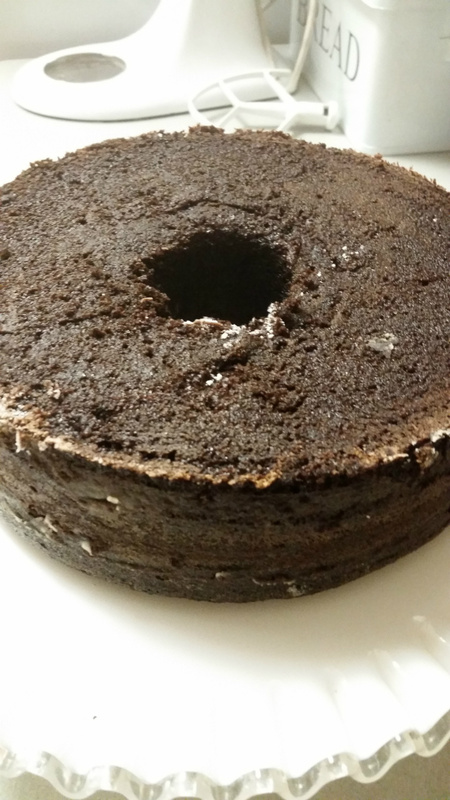 Rich chocolate flavor in an easy scratch cake! This cake is a hybrid between a homemade chocolate sheet cake and a homemade layer cake. It can be made in a bundt or tube pan. The frosting is simply a mix of melted chocolate chips and sour cream! It is amazing and I will use it for other cakes and cupcakes! 3. Meanwhile, dump together the flour, baking soda, baking powder and salt in your standing mixer bowl. 4. In a small bowl, stir together the milk and vinegar. Grease and flour a 9-inch tube pan. 5. 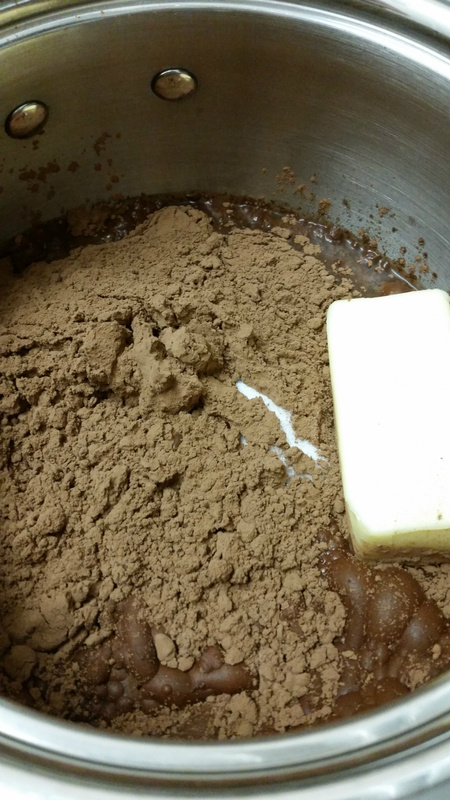 When the chocolate in the pot has cooled a bit, whisk in the milk mixture and eggs. Mix this in several additions with the dry ingredients using your standing mixer. When it is fully incorporated, stir in the vanilla. 6. Pour the batter into the tube pan and bake on the middle rack until a skewer inserted comes out clean, about 30 to 35 minutes. 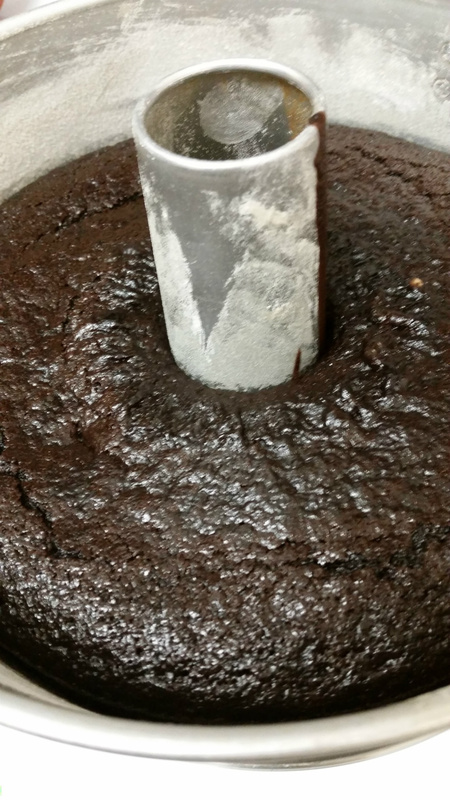 Let the cake cool for at least 15 minutes and remove from the pan, sliding a knife around all edges. Let cool completely. 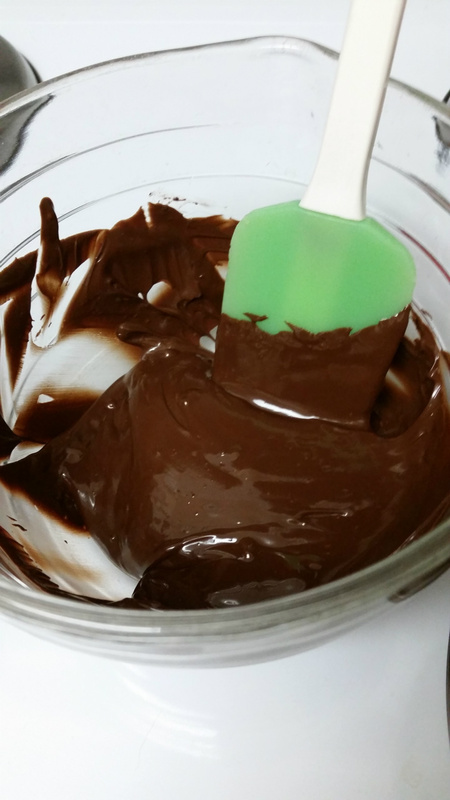 Frosting: Melt the chocolate chips in a double boiler or a microwavable bowl (1 minute 30 seconds and then stir) and let cool to room temp. Stir in the sour cream until the mixture is smooth. Refrigerate for 30 minutes before frosting the cake. I used coco powder instead of unsweetened chocolate. The cake rises significantly while baking. It came out of the pan smoothly with help from a knife! Sour cream and chocolate chips make a creamy frosting.